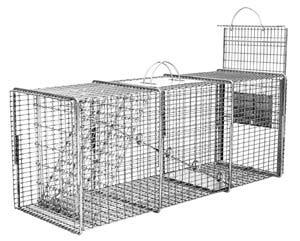 The Professional Line of traps are designed for Animal Control Professionals who require a durable, long life, reusable live trap. Bullet Proof - Our Professional Live Traps are the strongest, most durable, and most effective traps available. These traps surpass even our legendary "Original Series" traps when it comes to toughness. Super Strong - They feature a very strong frame with tighter mesh and heavier gauge wire. We've also added extra reinforcement rods for even greater strength. 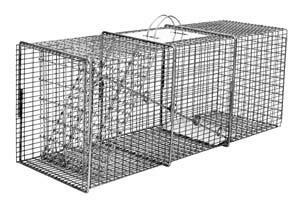 Our Professional Series Traps are the strongest steel wire frame of any box trap on the market! From 16 gauge on the small animal traps up to 12 gauge on the larger traps. Tighter Mesh Pattern - Tight mesh pattern prevents animals from reaching through from the outside to steal bait. It also prevents trapped animals from reaching outside to damage surroundings. And it adds even greater strength to this already beefed up trap. From ½" x 1" to ½" x ½"
Same Great Design as our Original Series traps with even stronger materials and more demanding quality specifications. Made in the USA - Simply put, these are the best of the best and are built to withstand years of daily use. They are manufactured in the USA at our facility in Wisconsin. Each trap is inspected and tested before it is shipped to you, our valued customer.